MONA has been a work in progress for Patricia Miller and me since its initial production at the Pasadena Playhouse in 2000. Since then it’s been presented in Atlanta twice, Chattanooga, Visalia, CA, and San Diego, always with a new song or two and some new dialogue. We’ve been fortunate to receive great reviews and audience response along the way, and we’ve been told it’s broken box office records in a couple of places. A limited run of the show in New York City, July/August 2007, garnered excellent reviews and played to sold-out audiences. 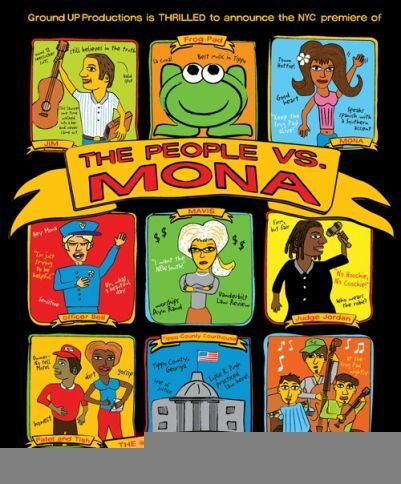 Samuel French will publish and license MONA in 2008. As the show begins, Mona is accused of killing her husband of ten hours by hitting him over the head with her Fender Stratocaster guitar. It continues in screwball comedy fashion toward a courtroom cliffhanger. Set in fictional Tippo, GA, MONA reflects Patricia’s and my small-town roots and the makeup of the New South.